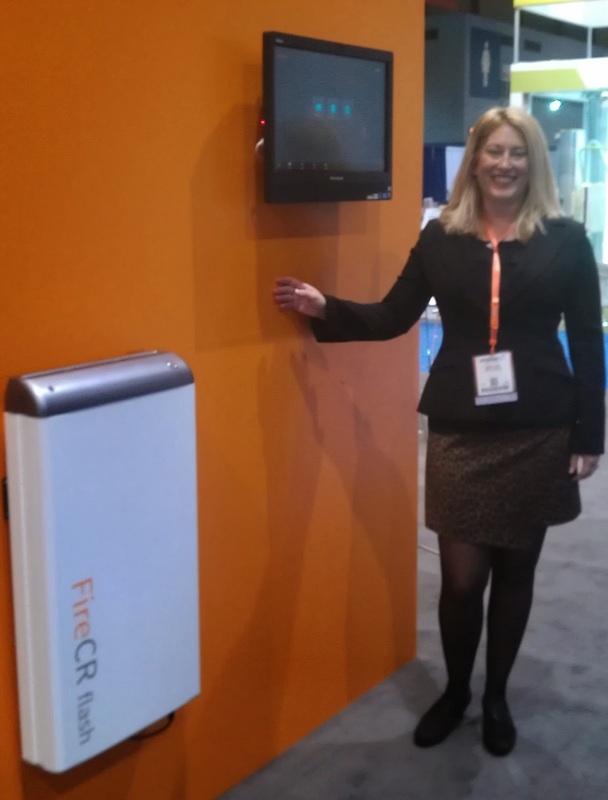 RSNA 2013: My top 10 on what’s new and what’s old, part 2. 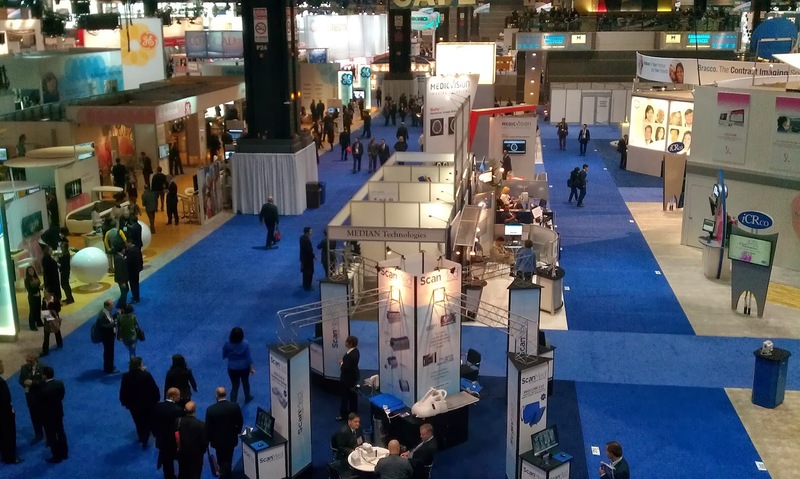 It is the second day of the RSNA radiology tradeshow in Chicago. I am flagging down a cab to get me to my 7 am breakfast meeting in the Hilton Towers, which is on my way to the conference at the McCormick Place. After this meeting, we hurry into another cab to get us to our courses, lectures, and appointments at Starbucks. I always have my phone close by to look for texts from those I am going to meet, who might be stuck waiting for the bus, held up with another appointment, or were called into a last minute customer meeting that has a higher priority than meeting with yet another consultant like myself. · Institutions and staff don’t take the time to do long term planning. Every PACS administrator I’ve talked with is in the middle of a PACS upgrade, or having trouble keeping up with all the changes required for Meaningful Use, or is just busy fixing studies and addressing other burning issues. Note that this is only from the ones I talked with who were sent to the RSNA, not those who did not have time or could not get the funding to travel to this event. No one seems to take time out to sit down with all parties involved and see how the workflow can be improved. · There is a big lack of knowledge of the clinical workflow among the people managing these systems. PACS systems were initially managed by radiology staff, with a PACS administrator reporting to the radiology administrator, who properly can set priorities and understand the workflow implications of changes, upgrades and new interfaces. PACSs are no longer just a radiology project but have become an enterprise activity taking care of managing images from multiple departments and specialties, and have migrated to IT for support of the hardware, (which has been located to their central computing center), and software (helpdesk support etc.). 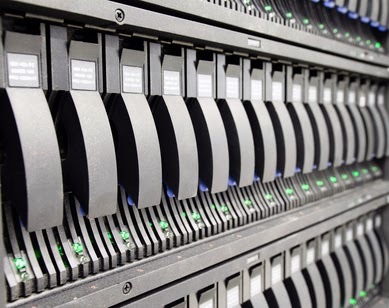 The most common complaint I hear is that access to the servers is now limited and a simple reboot or just checking status and/or files on the servers is close to impossible as they are locked out of accessing the main computer center, and that any support call now has to go through another two layers before it can get to the person involved. Needless to say knowledge of clinical workflows is greatly watered down at the support level with people who only have a pure IT background taking care of business. · IHE recommendations and profile definitions are still being ignored. One of the first profiles defined by the Integrating the Healthcare Enterprise (IHE) is called “scheduled workflow.” It was subsequently followed by an “unscheduled workflow” profile definition addressing the case when incomplete patient data is available for trauma cases. Standard DICOM and HL7 transactions were refined, and options eliminated as much as possible to come to a rigid and well-defined sequence of transactions. This results in the automation of changes in procedures, patient updates, and automatic verification by the modality of a study to allow for modality and workstation worklist synchronization. However, when I ask my students in our PACS training classes how many have implemented Modality Performed Procedure Step and Storage Commitment, which are essential components of the scheduled workflow profile and used to streamline the department workflow, I get either blank stares or at best a confirmation of maybe 10 percent of the audience that they have implemented this. One of the reasons goes back to my first comment, i.e. 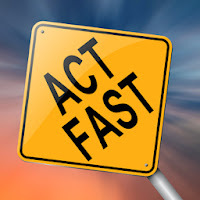 people being too busy with day-to-day activities to take the time to sit back and look at how to fundamentally change their workflow to really make use the technology they have available. · It is not about just the PACS anymore. Assuming that an institution has a well functioning PACS system, there are several other subsystems that have to work correctly, such as the critical results reporting and ER discrepancy reporting. In addition, to ensuring proper quality of care, one should also address the peer review process. With regard to the critical results reporting, there is nothing more frustrating to a radiologist than having to track down a physician to follow up on a critical finding marked code red, if there has just been a shift change, or when the finding occurs at the end of the day, or when the patient already left the ER having been sent home by the physician who missed the critical issue. Increasing integration with multiple systems is lacking (see integration comments below as well). 2. VNA: The implementation of VNA’s has moved from what the Gartner consulting group calls the Technology Trigger, passing through the Peak of Inflated Expectations to the Trough of disillusionment phase. In layman’s terms, it did not meet the expectations of the initial hype as people found that a VNA implementation has some major challenges. I found three types of VNA vendors, the first group are those who embrace it with both arms as they see that a full level 5 implementation (see related white paper of the different levels) gives them a strategic advantage and they seem to be very well positioned to address customer needs. The third group are those who interestingly enough are still ignoring the need to offer a full-fledged VNA and think they can just put another label on their existing PACS archive and hope that clients are not looking through the marketing smoke and mirrors and recognize that this is just the same old thing. One vender told me jokingly, upon asking me what I could do for him, that he wished I could take the VNA away, but unfortunately I don’t have a magic wand, and even if I had, I would not want to use it to turn the clock back 10 years, as VNA’s are here to stay and addressing the issue of providing a true enterprise image information and management solution using open standards is essential. a full VNA, such as synchronization between multiple PACS systems and VNA, full-featured routing and pre-fetching, tag morphing, information life-cycle management and support for a uni-viewer and HIE connectivity. These vendors have obviously underestimated the demand and are working hard to catch up. Many of them are learning the hard way by deploying VNA’s prematurely resulting in all types of workflow and other issues. 3. HIE and XDS: The establishment of Health Information Exchanges (HIE’s), either private or public, have been a major part of the US government’s initiatives to facilitate information exchanges to reduce unnecessary duplication of tests, and making observations and results widely available to health care practitioners. A key requirement of the HIE is the support for the Cross Document image and information exchange standards, aka XDS. XDS is not rocket science, it is based on existing standards, however, there are very few implementations of it. The reason for the relatively few implementations appears to be (according to the people I spoke with during this event) a gross misunderstanding of how it works, what it does, and what is needed for existing infrastructure to support it. Hopefully, a better understanding by training and education by the IHE committee and other third parties (here is a shameless plug for the training provided by OTech) will change this. integration is his main issue. He said he is reading images from multiple facilities using a so-called worklist aggregator, which communicates between the several PACS vendors and provides a composite worklist to his workstation. This software needs to integrate with his PACS systems, his voice recognition system and the RIS. In addition, the system interfaces with the EMR to export the reports as well as images. Therefore, in total he has four systems that need to be integrated. It used to be two (PACS and RIS), followed by the voice recognition and now the EMR as well. It appears that the level of integration and associated complexity has reached the upper limit as he is struggling with several interface and integration issues. Just coordinating the synchronization of these systems with regards to upgrades is likely a major issue, for example, if the PACS is upgraded, it has to be tested and verified with four other systems. Imagine if he had an additional peer review system, and critical results reporting system, as well as dose reporting system. 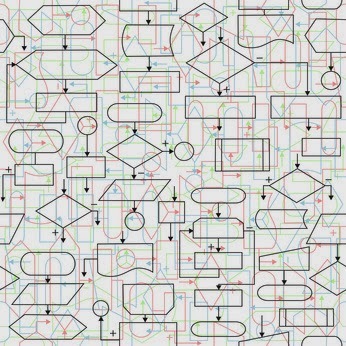 I don’t know if that is going to be manageable; it seems that the limit for systems integration is about to be reached. 6. Bedside integration: Anyone who has visited a hospital room lately has seen the COW’s (Computer on wheels), that are used by the nursing staff to take vitals and other information about a patient. Increasingly, the clinical features are integrated with patient resources and entertainment at the bedside through a stationary monitor. 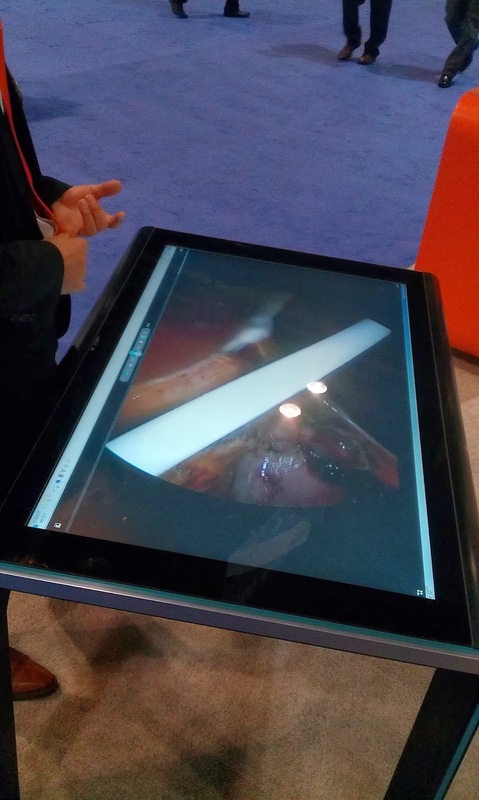 One vendor demonstrated this whereby this terminal can show not only your movie on demand, but also pull up a patient record from an EMR, including any corresponding images, take vitals, and even allow for a teleconference with a physician or nurse using the small camera, (which can be physically covered when privacy is needed). A wireless keyboard is provided as well. 7. The use of gaming controls to view images: Last year I saw an adaptation of one of the gaming consoles to use gestures to control a monitor. This year there were several demonstrations, both as part of the scientific exhibits and built into commercial products. This application is primarily for use in conference rooms and for teaching whereby a physician can remotely manipulate images. radiologists in their regular reading. However, a new auto-scroll device might help them as many are suffering from wrist issues from using the mouse and/or trackball day in and day out. 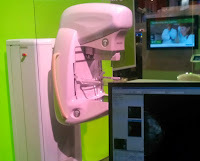 This device, which simply connects between the trackball and the computer will automatically scroll the images, which is especially important for axial images sets such as for CT and MRI. Hopefully, this will prevent some carpal-tunnel syndrome sufferers in the future. 9. Virtual anatomy tables: also this year there were multiple vendors showing, what is known as the “virtual pathology table,” which is basically a large touch screen display laying flat and built into a demonstration table which allows for a physician to manipulate data that is typically based on a CT ort MRI 3D data set thereby performing a “virtual autopsy.” This is a great teaching tool, and can also be used for forensic applications in case a person has been buried provided they had a CT scan done in case there are follow-up investigations. 10. 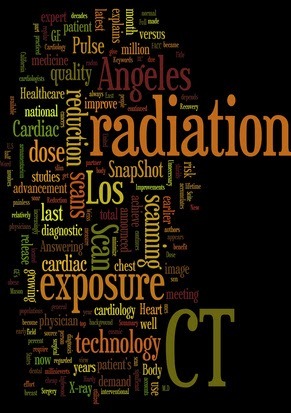 Dose: The registration of radiation dose has become even more important as several states have enacted legislation or have bills pending approval that require dose registration of CT scans as a minimum, and potentially other X-ray exams in the future. Every institution in the affected states is scrambling to establish a set of policies and procedures matching the technical capabilities that are available with additional software solutions. Unfortunately, existing systems have to be upgraded to export the well-defined DICOM structured reports that contain the dose information, which means that in the meantime, several vendors have implemented band-aid solutions, which rely on screen-saved dose overview information, which has to be interpreted using OCR (Optical Character Recognition) software. There seems to be a consensus that this information is to be stored at the patient level for example, with his or her personal health record, however that infrastructure is not (yet) in place and therefore many store the information in a EMR, or even a PACS or RIS where it obviously does not belong. It will take a few more years for dose registration to become ubiquitous and be seamlessly integrated into the regular workflow. In conclusion, the most heard “old topics” were VNA and uni-viewers, workflow, HIE and XDS. These are still immature and will need several years to come to fruition, I am sure we will see them again at next year’s tradeshow. In the mean time, look for part 3 of this series coming up soon. 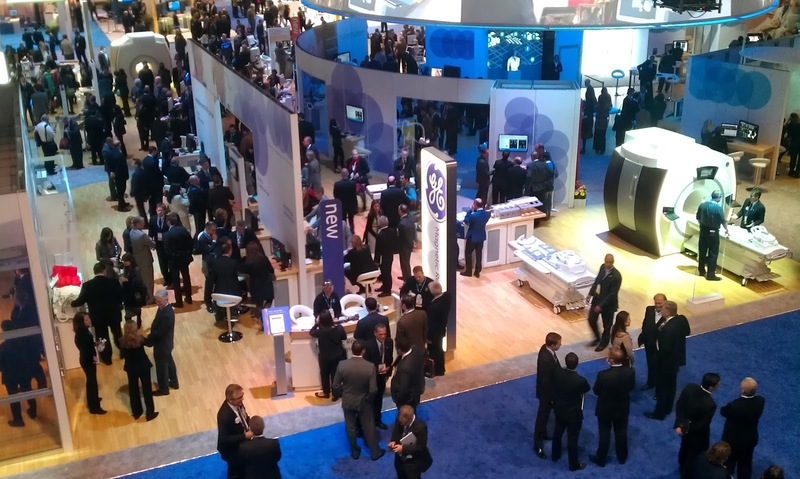 RSNA 2013: My top 10 on what’s new and what’s old, part 1. It is a brisk morning, typical for November, and I am waiting for the bus to get me to the annual radiology circus: RSNA 2013 in McCormick Place conference center in Chicago. And a hustle and bustle it is indeed, especially around 10 am when the exhibition starts, and at 5 pm when it ends, and between scientific sessions when everyone is running to the next classroom to attend a presentation on the next latest and greatest technological innovation, or a lecture in order to get their CME credits. Having a technical background, I can only comment on technological innovations and the curiosities at the meeting. These observations are obviously totally subjective and are offered as only a partial impression of what was shown. My findings are based on the OBWA method (Observations By Walking Around), i.e. seeing if there is something interesting that catches my eye and by talking with the many friends and colleagues and ex-colleagues, in the hallways, corridors and at the bar in the evening. This list is unlike the other RSNA news reports that are biased by published press releases or interviews from the industry “experts” with the inherent hype and vaporware. Multi-energy CT’s: Some of you might remember the very first generation of rotational CT’s, where a gantry containing the X-ray tube and detector were located in a rotating ring and images were taken slice by slice by rotating the gantry, and alternating clockwise and counterclockwise around the patient. Scan times could be 15-30 minutes with an additional 15 minutes or so doing the numbers crunching to create a set of maybe 50 images. 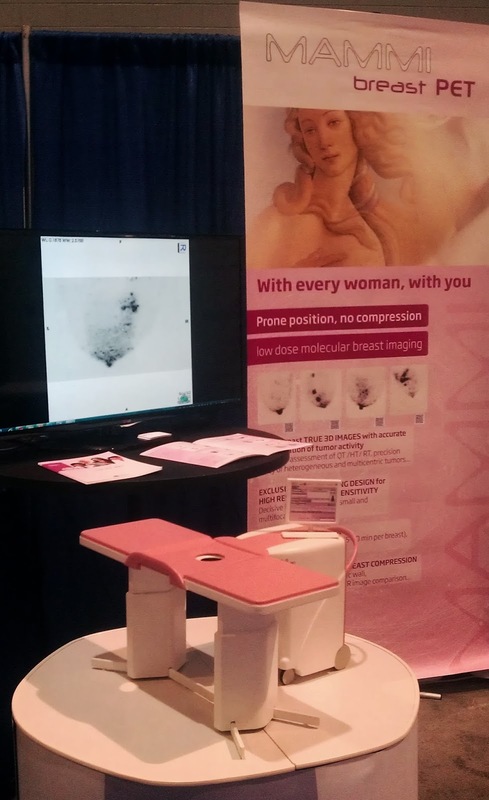 Since then vendors introduced slip-ring technology to have a continuous rotation, multi-slice detectors to provide orthogonal voxels providing the source for excellent 3-D imaging, high-speed rotation of fractions of a second to allow for dynamic studies such as used for cardiac applications. Every time one might think the technology has matured, yet another innovation comes along to provide a complete new dimension and/or paradigm, such is the case with the CT multi-energy imaging capabilities. By processing two images that are acquired using a different energy spectrum, which can be done by using multiple X-ray tubes, switching voltage or, in the case Philips, multiple detectors, each with a different energy absorption characteristic, one can create different images that can provide more information than just the traditional attenuation information expressed in Hounsfield units. 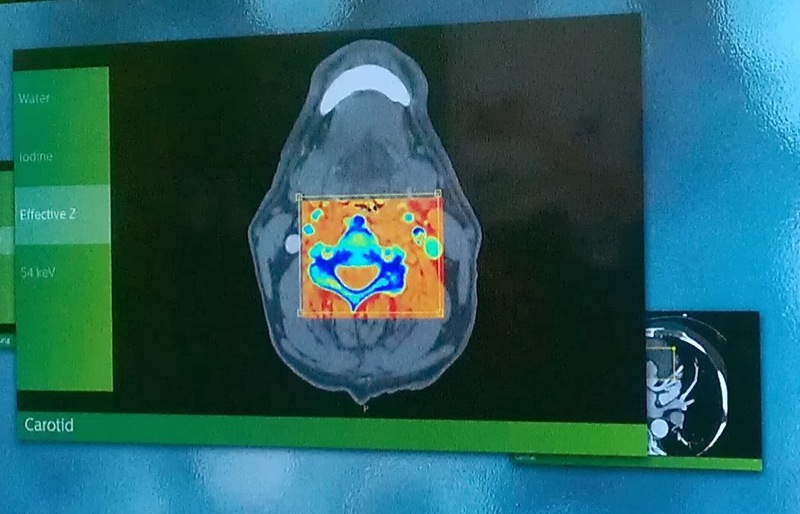 The images looked to me like fused PET/CT images however, the color images contain much different information using atomic numbers, which we will probably have to learn to interpret similar to when we saw the very first MR images. The CT images were created on a CT that is pending FDA approval so there is not a lot of experience available yet but who knows, this technology might become standard over the next few years, similar to the multi-slice capability of the recent CT’s. the risk of cancer just as other factors such as nutrition, lifestyle, and genetic disposition can, and therefore any imaging solution that reduces the dose for digital mammography can only be applauded. With annual screening for women from let’s say age 50 to their average age in the US of 81 years resulting in a total of 31 exams, typically with two views or images taken for each breast. 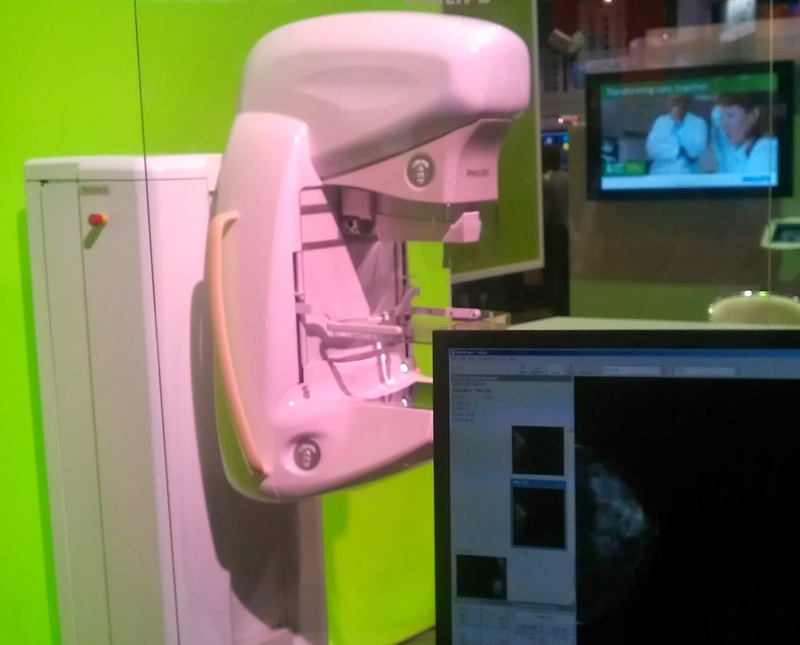 The good news is that the new Philips microdose digital mammo system uses a slit-scanner technology, which means that the tube rotates at an angle to scan the detector plate thereby reducing the dose by 40% according to the vendor. There are a few hundred of these systems installed in Europe, especially in Scandinavia and France, and installations in USA are just starting. Hopefully, this will challenge other vendors to either adopt this technology or rethink their implementations to achieve a similar reduction in dose. novelty, something many, including myself, would never consider until a good friend of mine shared with me the fracture of his wife’s leg, which he had posted on his facebook page after she had a traffic accident. For those who have been ignoring facebook, I suggest you look a the “Radiology Signs” facebook page which allows people to post interesting cases, which has more than 400,000 “likes” as of today (are there even that many radiologists connected to facebook?). That is why at least one vendor is implementing a “facebook sharing” option in their PACS viewing software, obviously after making sure that the image is totally de-identified and stripped from any personal information. I believe that the power of social media cannot be underestimated and it might become not only a great education tool but also a forum for interaction and communication. was about partnership. I have seen partnerships between radiologists and other physicians in several institutions, notably those where physicians are on staff and paid by the hospital, which seems to avoid a lot of turf wars and breaks down silos between the different specialties. However, partnerships between radiologists and patients are a new concept as it is mostly the primary physician who gets a copy of the report and reviews it with the patient. As a matter of fact, unless a patient takes the effort to look at the person who signed the radiology report, he or she is almost never aware of who did the interpretation anyway. Therefore, even though it might be a good idea, I doubt that a radiologist would even return my phone call if I tried to call him or her about a diagnosis. I am fortunate in that I know several radiologists personally and if I want to ask a question about my or one of my friend’s or family member’s radiology exams, I send them a CD and ask for their (second) opinion. However, that is not an option for most people. Therefore, in my opinion, these are nice catchy phrases and make good headlines, but there has to be a major culture shift to make patient partnerships in radiology happen, if it ever will. images in a PACS or enterprise storage solution, but it is typically based on a relational database such as Oracle, Sybase, MySQL or other commercial or open source product. 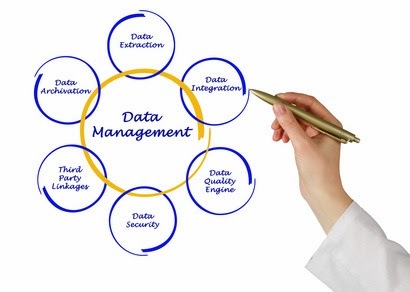 Databases were not designed with managing patient information in mind, except for the somewhat ancient MUMPS, which is both a language and a database, is the core of many of the popular EMR’s but is not typically used in PACS system databases. In addition, commercial database licenses are not cheap and therefore impact the system cost significantly. Therefore it is no wonder that vendors are looking for alternatives. Voila! 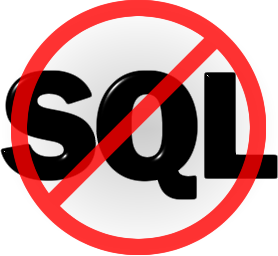 the NoSQL, which stands for Not Only SQL, which indicates that they can still be accessed using SQL queries but also allow for other access methods. NoSQL databases were invented in the late 90’s and are very scalable and highly optimized for simple retrieval and updating operations such as used for medical applications. The nice thing about designing a product from scratch, which as an example, Karos did with their new VNA implementation, is that it allows you to use the latest technologies instead of porting or converting it from older technologies. 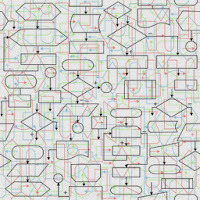 NoSQL might become a good alternative to the commercial databases that are not as suitable and overkill for what a PACS or enterprise archive solutions are trying to accomplish. with regard to efficiency and cost. Most institutions don’t have a good handle on how much it costs to perform a diagnostic procedure other than the amount of the reimbursement from an insurance company or medicare/medicaid. In order to analyze information we need to measure its input and make sure it is correct and accurate. 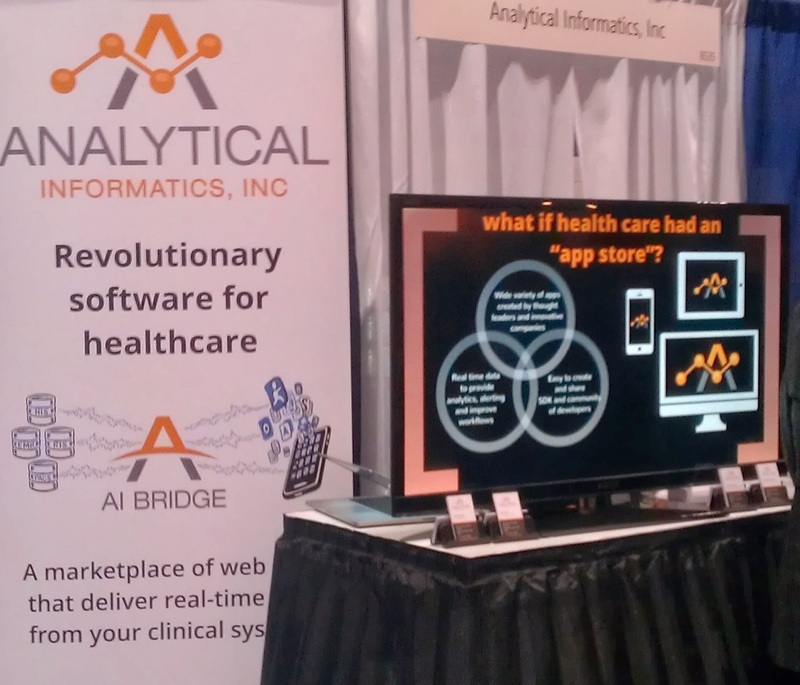 There are several companies offering analytics, most of them I had never heard of before, which showed information displayed on very nice dashboards, however, when talking with them I found that there is still a lot of missing and “dirty” information out there. There is also a lack of standardization of workflow and terminology, which SIIM is working on as part of their SWIM (SIIM Workflow Initiative in Medicine) project. Together with consistent terminology there needs to be a consistent implementation as well. For example, DICOM header information might contain one or all of the Attributes: Study time, Series Time, Acquisition time, and Content time. Some PACS systems even add a timestamp when an image is received by the PACS archive. Consequently, which time do you use to define a procedure length is at best a guess, especially if you want to compare modalities from different vendors who are using different Attributes in their image header. Similar problems occur when you want to record the report turn-around time: is the end time defined by the time that the radiologist signs the report electronically (assuming this is available), is it the time when it is sent to a report repository such as at the RIS, or when it appears in an EMR, it is faxed to a physician, or when it appears in his (secure) email inbox? In conclusion, there is going to be a major increase in analytics but we will have to do a lot of standardization of terminology and measurement, as well as data clean-up before we can trust the results of these tools. encountered was a FUJI CR and it occupied a small room. That system included a printer as well as the CR technology and was ahead of the PACS infrastructure, which followed within the next 10 years. The first challenge was to make a CR small enough that it would fit on a table as a “tabletop” system. Having achieved that over the past 10 years, the latest technology allows it to be so small that it barely sticks out from the wall. The affordability also has come down so much that small practices, and even dentists, veterinarians, and chiropractors are now considering digital technologies instead of film. 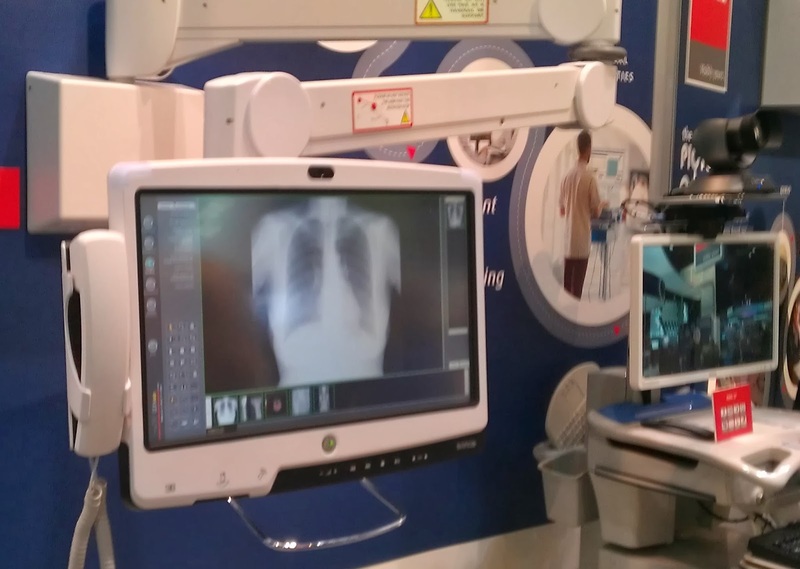 These are also great solutions for emerging and developing countries where there is an installed base of film X-ray equipment, which is a barrier to providing healthcare by itself as many can’t afford the film and associated developing costs. There will still be a need for larger high volume CR systems, but I would think that these small CR systems will become as ubiquitous as the many small copiers you find in offices in addition to a high speed copier in a central mailing room of an office. departments, I would always carry my X-ray radiation badge with me. I remember that I occasionally forgot to take it out of my carry-on luggage at the airport, which caused a call at the end of the month from the radiation safety officer at my company questioning why the readout of the badge was much higher than normal. New badges are getting more sophisticated as they now can measure this information and send it wirelessly to a repository. This replaces the old collection and distribution system making it much easier and convenient, also allowing semi real-time monitoring. scale model and/or a monitor showing its images. Obviously the RSNA organization itself would have liked to rent out more space, but also if I were to buy a million dollar or more piece of diagnostic equipment, I might want to touch and feel it, similar to wanting to kick the tires when buying a car. Consequently, this year, if I had wanted to see the equipment prior to signing on the bottom line, I would have to travel to another facility to see it installed, or visit the manufacturer’s facility. 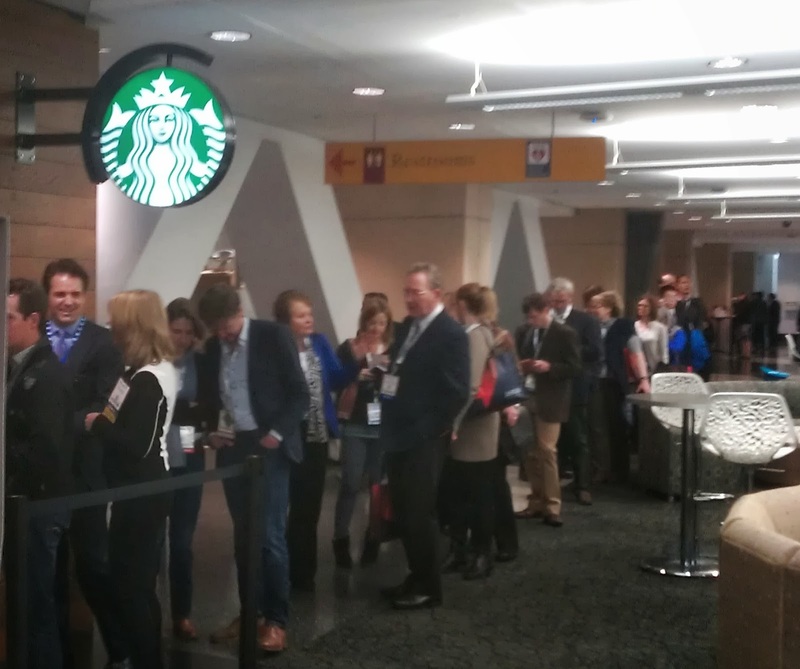 I understand the cost savings to the vendors not having to haul these systems around, but I would feel somewhat cheated as a potential customer, especially after paying hundreds of dollars to be able to enter a tradeshow like RSNA. minutes to get a cup of coffee at the exhibition hall Starbucks, but having to stand in line for more than 30 minutes at 10 am in the morning just to pick up a badge and wait even longer for the bus getting back to the hotel at 5 pm while being exposed to CO2 exhaust fumes in the catacombs of the conference center was unexpected and in my opinion due to poor organization and customer service. I’ll definitely arrive earlier and depart later next year. Hopefully there will be more registration contractors and buses next year as well. 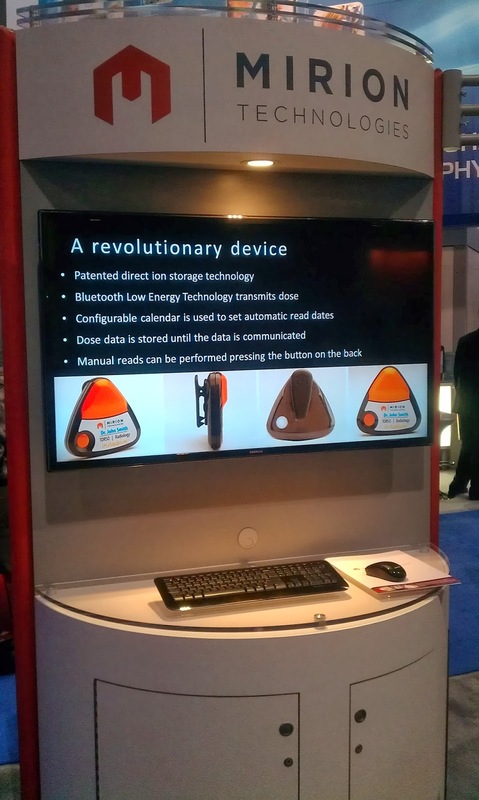 These were my observations about what’s new, and to be honest, there was not much earth shaking and or very innovative this year, as much technology has matured, which is why I will have a follow up on “what’s new and old” as well as “what old news,” in parts 2 and 3 of this report on RSNA 2013 (stay posted). 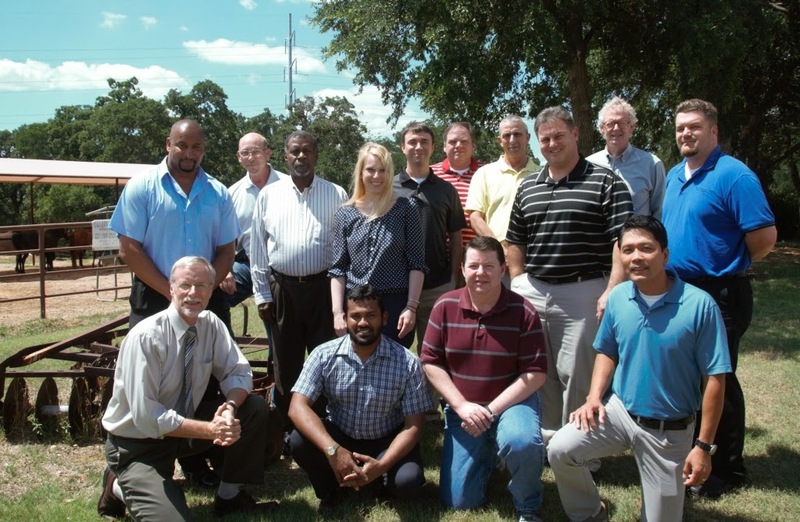 The quest to train professionals with in-depth hands-on DICOM and HL7 experience. The current penetration of EMR’s for physicians is already exceeding 50% and for hospitals it is more than 70%. 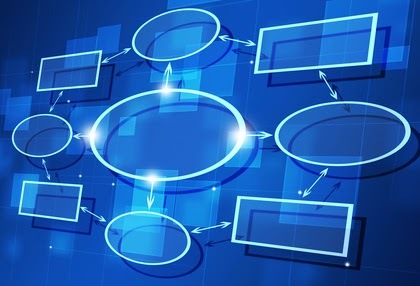 One of the most common issues that are brought up by CIO’s about their implementation challenges is the lack of available expertise to integrate these systems with their order entry systems, lab, pharmacy, and the numerous other connections. 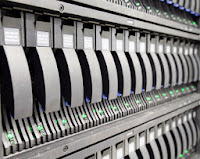 A typical institution has about 150 computer systems ranging from surgery to blood bank, all of them typically exchanging this information using the HL7 standard, and many of them needing to be connected to the new EMR’s. 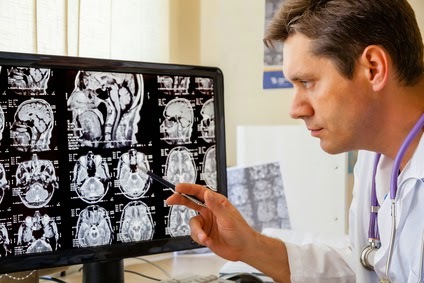 In addition to the much sought after HL7 expertise, as these systems are going to be increasingly “image enabled”, the need for professionals with detailed DICOM knowledge, especially for the integration and troubleshooting, will also undoubtedly increase significantly. If you are looking for an opportunity to strengthen your skills, here is your opportunity as OTech offers its next DICOM/HL7 seminar (see schedule) in the second week of December, following our popular PACS administration certification class in the Dallas Metroplex. The HL7 training covers a comprehensive discussion on the Version 2 standard, including a hands-on section which allows students to create and test HL7 messaging from a variety of applications. The DICOM training covers not only the DICOM protocol and data format specifications in great detail, but also provides students with numerous tools and test images to be able to implement and troubleshoot integration projects. Especially for those living in the Northeast and Midwest, this seminar in the Dallas area will be a nice break from the cold while having the opportunity to eat some local BBQ and steaks (and yes, if you are a vegetarian, we have lots of choices as well). Looking forward to see you in Texas! It is 11 0’clock at night when Francisco, one of our porters, wakes us up. 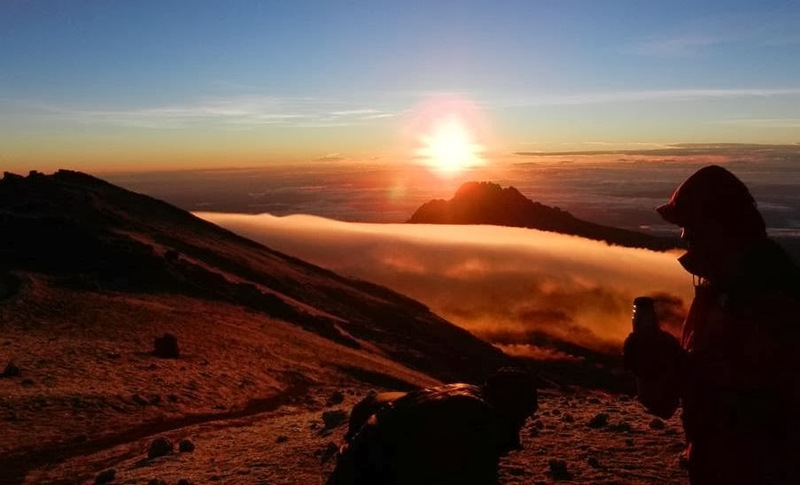 We are camping out at the base camp of Mount Kilimanjaro in Tanzania, Africa, which is at an altitude of 4662m or 15,295ft (higher than any of the mountains in Colorado). It is freezing cold, we slept in our down sleeping bags with extra clothes, and chemical hand warmers in our double pair of socks and some of us even have a hat on, leaving only our mouths and noses in the air to breathe. There are six of us, my spouse Johanna and I, another couple who we have traveled with many times before, our team leader, and his buddy. We dress quickly in the dark, get a couple of snacks and hot tea in our “dining tent,” which had been carried up to the base camp by one of our 27 porters. Going up and down a mountain in 6 days is quite an expedition; we had two assistant guides in addition to the trek leader, a cook, and 23 porters who carried the food, water, tents and our luggage from 1800 meters or 6000 ft at the entrance gate to the camps. At exactly midnight we are ready to hike up our last stretch to the peak. We have little headlights strapped to our heads that show the terrain for about 6 feet ahead of us. On a typical night, there are 50-100 people who attempt to make the ascent to the top. More than 50 percent of those who start the trek don’t make it to the peak. The fortunate who do must be able to withstand the cold and high altitude. A common misconception is that there is less oxygen at high altitude, actually there is the same amount of oxygen in the air as at sea level, however, the difference in air pressure makes only 50 percent of that available to our lungs at that altitude, which the body compensates for with a higher pulse rate and deeper breaths to increase the number of red blood cells carrying oxygen. Three guides and two porters, one of them carrying an emergency oxygen tank, “just in case” accompany us on our last stretch. Our lead guide, Charles, is setting the pace with tiny steps going up the mountain. It gives the term “slow walking,” or as it is called in Swahili, “pole, pole” a completely new meaning. Looking up, we see that several teams have left before us, providing an almost surreal view, like a procession of lights winding up the mountain. I am carrying only the bare minimum in my backpack, a “camel-back,” which is a plastic bladder filled with about 1.5 liters of water and two water bottles. 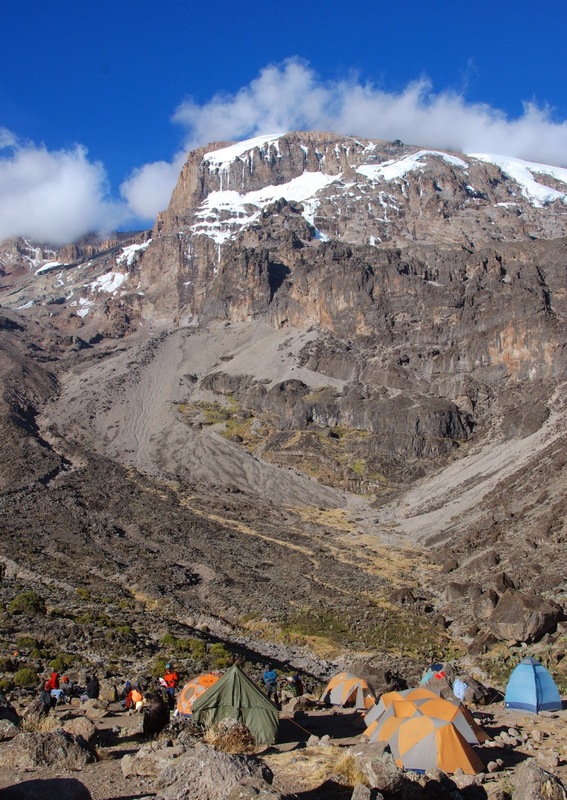 The water was carried up by our porters from our last camp, the last spot on the mountain where water was available, which after being filtered and boiled to kill all of the bacteria, is needed to prevent dehydration, one of the major causes of failing to make it to the top. After a few hundred yards of hiking, I am already out of breath and have to stop after every couple of steps. At this point, I doubt that I am able to make it up. Passing an emergency stretcher alongside the path, used to evacuate those who are struck with a severe case of altitude sickness, does not help mentally. Nicholas, the youngest of our three guides notices that I am having difficulty and takes over my carry-on in addition to his own pack, which is a major relief. I am at the back of the pack, and have no clue how everyone else is doing as the only thing you can see is their lights. After the fact, I learned that our female climbers in the front were having a hard time as well, but they managed by taking five steps at a time, and then pausing for three counts as they take deep breaths. It is all about finding the right rhythm: one step at a time for the next six or seven hours. My guide’s releasing me from my backpack, which was only a couple of pounds, gave me the physical and mental boost to keep on going. As long at the incline is not too bad, I can keep on going, but I do have trouble keeping myself balanced after I have to take big steps such as to master a high rock or step. Nicholas, my guide is there always to correct me or give me a little push. We stop only for a few minutes every half hour or so, because it is below freezing at 10 degrees, with the icy wind making it feel like we are at the North Pole. Despite the fact that each one of us has at least five layers of clothing on top, three pair of pants, several pairs of socks and mittens, the temperature is still just bearable. The hardest part to keep warm is our hands. They are quite exposed, as we need our trekking poles to balance and pull us up. 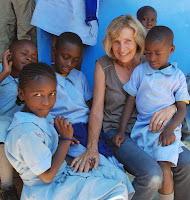 When resting, other teams pass us, while greeting us with the familiar term “Jambo,” which means “hello” in Swahili. The terrain is hard to cover as most of the path is covered with loose gravel, which is not only hard to walk on, but every step up is about two thirds effective as you automatically slide down a little. It is like walking up a sand dune with loose sand but worse as we have trouble getting oxygen in our system. After about two hours, most of our water becomes inaccessible as it starts to freeze up. Our female friend’s camelback supply line was nicely protected by an expensive REI enclosure with a zipper that also froze, which made it useless. 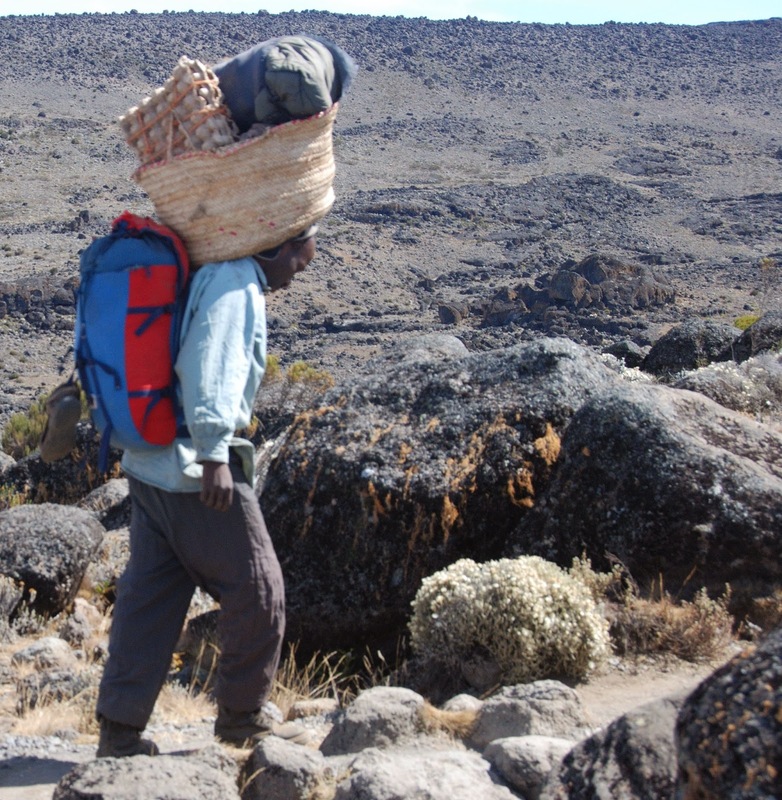 I found that the best solution for carrying up our water was to take a water bottle and put it in the backpack rolled into two woolen socks, something we learned from Charles our guide, not from our guidebook, which we read back and forth several times during our preparation. At about two-thirds of the way to the top, I have increasing difficulty keeping my balance anytime I have to break my rhythm to take a large step, and I am again starting to doubt whether I will be able to make it. 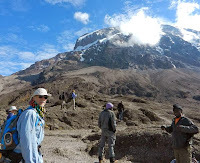 Looking back, this was probably either due to dehydration, as I had not been drinking on a regular basis because of my guide carrying my water, or due to exhaustion. We had hiked for eight hours the day before and had only three hours of rest prior to this last part. Nicholas, my lifesaver notices my balance problem and takes me by the arm. He forces me to keep my rhythm even though I am thinking I am at the max. It is interesting how much more your body can do if you just set your mind to it and have the right support. In the meantime, the sun is rising, providing us with an incredible view. The only thing I can compare it to is when I have watched the sun rise from the window of an airplane when making a trans-continental flight. It is truly like being on top of the world as the sky turns orange and we can see the clouds far below us in the valley. Nicholas is pushing me as he probably knows that this is the only way I will be able to make it, so we pass the other team members in the front by keeping a regular rhythm, one step at the time, not allowing me to rest or stop. When the sun is coming up, I can see the rim of the mountain far ahead of me. In the meantime, we have finished the stretch of “switch-backs,” which are needed to master the steep ascent before reaching a relatively gradual incline. I let go of my guide’s arm and walk the last few hundred yards only supported by my walking sticks, almost like a last sprint to the finish line. When I arrived at the rim, I sat down under the sign of what is called “Stella Point” at 5745 meters (18,848 feet). After another 5 or 10 minutes, the rest of our team arrives, joyful that we came that far. 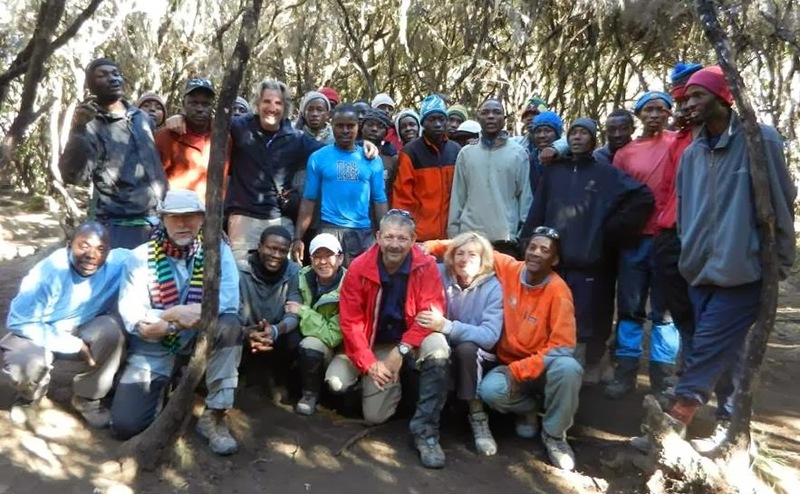 I had made up my mind that I was going to stop right there, but just in case, I asked our main guide, Charles, how the terrain is going to be for the last kilometer, ascending another 100 meters of elevation. He assured me that this was going to be “easy,” so after taking a short rest, I decided to go for it. And Charles was right, the last part was not as steep, in addition to the fact that it was light so we could see the peak in front of us, and the sun was also warming us up. On our left we can see the glacier, a fraction of the original size due to the effect of global warming. 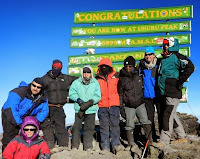 Finally we arrived at what is called Uhuru peak, at 5895 meters or 19,341 feet, at 7:20 a.m., the culmination of four days and one night of hiking. 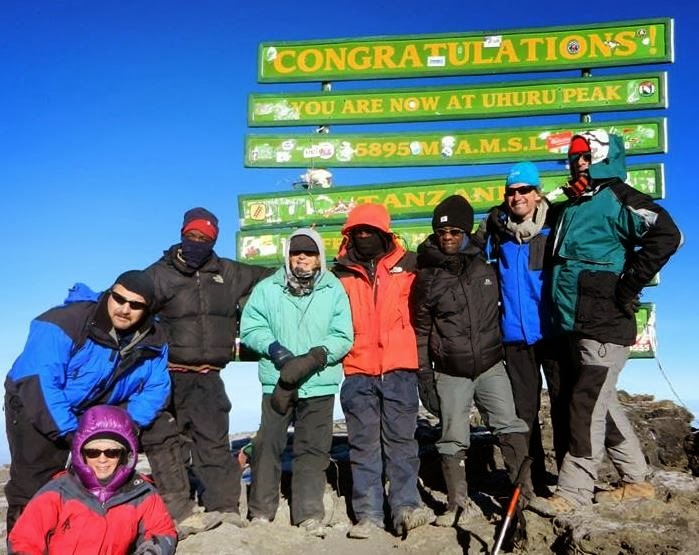 We all hugged each other and took a short time for pictures, not too long as it is really cold at that high altitude. The last segment had taken a heavy toll on our team. 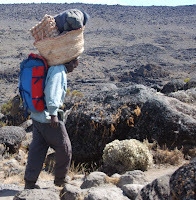 Our leader’s friend did not feel well at all and took off almost immediately to get back down with our two porters. Our friend had started wheezing, probably caused by combination of the reduced air pressure and the dust we got in our lungs during the ascent, so he had to take it easy coming down accompanied by our chief guide, Charles. I was still exhausted and had to lean on Nicholas, our assistant guide, for a big part of the way coming down. Except for our team leader, who was the only one who had any high altitude hiking experience, our ladies had the least difficulty. Interesting how the women outdid the men on this trip. 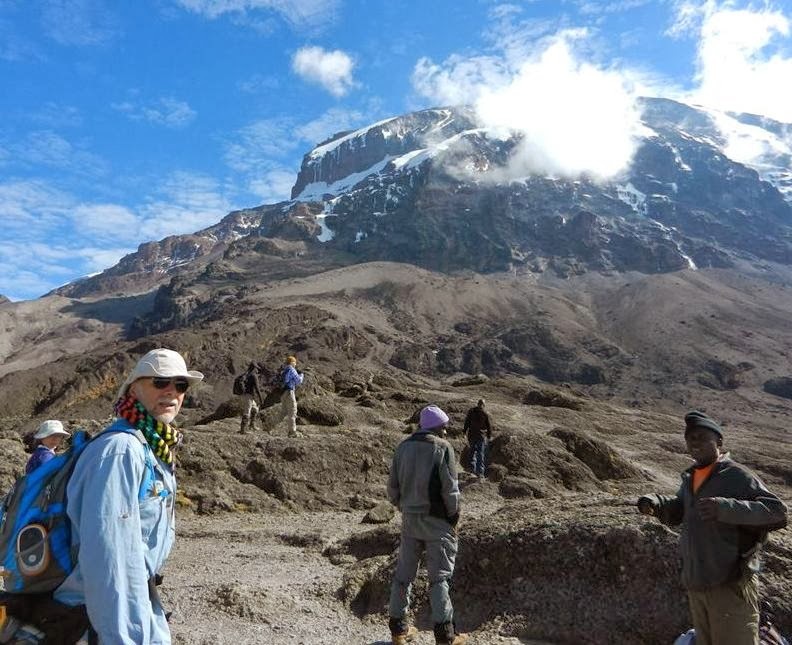 Hiking up to the top of the highest free-standing mountain in the world is definitely not for the faint-hearted, you have to be fit, adventurous, and be willing to test your physical and mental boundaries. If you are not comfortable expanding beyond your comfort zone, it is not for you. I am glad we did it, in addition to the fact that we served a good cause as it was part of a fund-raising effort (www.carehighway.org). It is also not for “control-freaks” as you have no control of what the weather conditions are going to be, or how your body is going to react. It is like going into space for the first time, there is no true training ground. We saw experienced hikers who could not make it to the top, and on the other hand, we also met a 69-year-old gentleman who made it (albeit with help of an oxygen tank). So, even if you are not into hiking, I suggest you do something crazy that forces you to expand your boundaries. This adventure truly changed my life, and I am sure doing something similar will impact you as well in a positive manner. Critical Results reporting, the missing link from a PACS. The more mature PACS systems have become, the more it becomes obvious that there are still certain key functionalities missing, which have to be purchased as an “add-on” to have the system to meet the clinical requirements of reliable and timely physician communication. 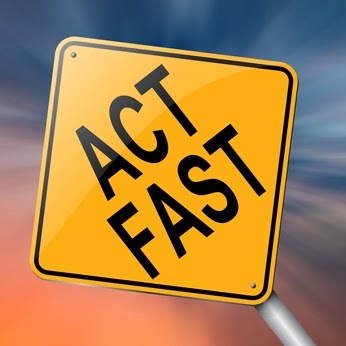 These add-on critical test results messaging (CTRM) systems, as they are called, are especially important if there are critical test results that need to be acted on within a very short and defined time period. This is important for radiology results and for other imaging specialties, especially cardiology, but even more for lab results. The classic example of such a result is when a radiologist observes a critical finding at 5 pm on Friday afternoon, which needs to be taken care of within the next four hours, and the patient has already been discharged, and the referring physician is unavailable after hours. In these cases, there has to be a well-defined chain of communication of that test result to the appropriate physician, with confirmation of the interpreted result and the action taken. A special case of a critical result report is the ER discrepancy report, whereby an ER physician might have discharged the patient having missed a fracture or other important finding. I have first-hand experience with such a situation when my daughter, a few years back, went on a school trip to Colorado in the winter. The car with six students ended up in a ditch because of slippery weather. The students were transported to the ER, and subsequent X-rays did not show anything at first reading. The students continued on their school trip, and a radiologist came in the next morning and noticed a neck fracture in my daughter’s friend’s X-ray, and it took them another day or so to locate the girls in the lodge where they were staying. She was instructed to go back to the hospital immediately to be fitted with a neck brace. If a reliable means of communication between the ER physician, radiologist and patient had been in place, the potential risk would have been avoided. CTRM systems are provided by several vendors, each with varying functionality. 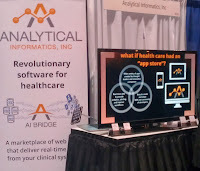 They can be integrated with the PACS, RIS, reporting system, or EMR. Most systems are tightly connected through a proprietary API interface. The workflow supported by these systems depends on the configuration capabilities. One should also make sure it supports the workflow that is used within your institution. It is possible to use one system for multiple specialties, or having multiple systems for each department, each with their own interfacing challenges. When planning to purchase a CTRM system, one should perform a due diligence investigation that includes defined specifications for the requirements, test and acceptance criteria and site visits of installed systems in a similar environment. Otherwise it might not meet the requirements. More details can be found in this video showing a discussion about the implementation steps.